This is Benson: a.ka. Benny and Lily reporting to you live from the CNN Broadcast Center here in sunny and warm, yes warm California. Lily, we understand the word on the streets from a few of our furry friends is the unseasonably warm temperature they are experiencing. Yes, Benny Boy that is correct. I have heard “warm for November” and “It feels like Indian summer.” Not quite sure what an Indian summer may be Benny. However, it must be warm. Lily, I realize we have friends of all shapes and sizes around the globe and our heart goes out to those in the rain, snow and freezing temperatures. Stay warm…..and for us…enjoy the sun and warm weather. Well furry friends and humans have a relaxing evening. 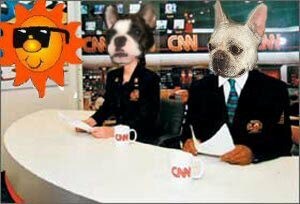 Signing off for CNN, Benny and Lily live in the studios. CNN has never had better reporters! Wow you two got promoted from bloggers to CNN Reporters! That is super pawsome!!! You did a fine job. Sadly it turned cold on us yesterday...temps were in the 40's. This weather is the best! Cold enough to make ice cubes in my water bowl overnight, but warm enough for sun baking during the day. I am hoping for some sun this weekend and hoping that my playdate will happen! Thanks for the excellent weather reporting! Great job guys! We would like to become your agents! We have torrential rain in the UK at present with lots of flooding! Thankfully we live at the top of a hill so are OK but lots of people have had to be evacuated from their homes!!! You will be able to report on that next time. CNN will never be the same again! Wow...good job! Maybe you can take over Lou Dobbs' show! Send some of that nice weather to Indy...it's cold and rainy here and mom is freezing her hoo-haa off! 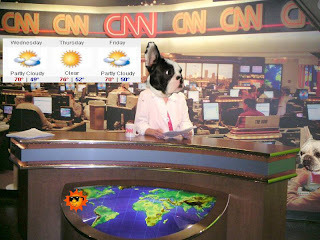 WOW...you all make PAWESOME reporters!!! We are sure glad you are having warm weather enjoy it while it lasts.. We have warm sunshine too but they are predicting rain this evening. My 3 little ones are toasty warm by their fireplace in Anchorage Alaska. Glad you are having a long autumn season!! Stay cool!! Could you two give us the forecast for the coming four day Thanksgiving holiday? No snow please! If you two need a meteorologist for your broadcasts, give my little sister a yell; she's the BEST! Here is not too hot. Just a little cold. Perfect for nice walkies! Wow, Lily! You even did the true diva move and managed to switch outfits within the broadcast! You go, girl!! Whoa, your mamma got you guys workin' for a living? Looking good! You two got a promotion I see! Congratualtions and you did a marverlous job! we are enjoying First Nations summer here too.